This black SUV has an automatic transmission and is powered by a 2.4L H4 16V GDI DOHC Turbo engine. Motivated by that effortless motor it gets 11.6 L/100 km in the city and 9.0 L/100 km out on the highway according to Transport Canada. Our Ascent's trim level is Touring w/ Captains Chair. Upgrade to this Ascent Touring and get more features without breaking the bank. It comes with a panoramic sunroof, an 8-inch infotainment system with Apple CarPlay and Android Auto, rear HVAC controls, three-zone automatic climate control, a power liftgate, blind spot monitoring, EyeSight driver assist system, heated front seats, and more. This vehicle has been upgraded with the following features: Sunroof, Heated Seats, Power Tailgate, Blind Spot Assist, Eyesight, Apple Carplay, Android Auto. 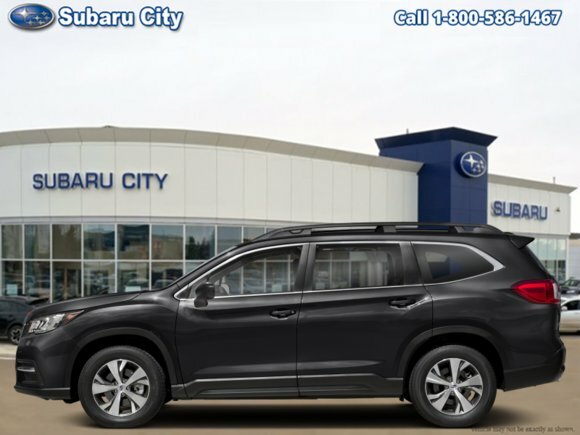 Want to try the 2019 Subaru ASCENT Touring w/ Captains Chair?